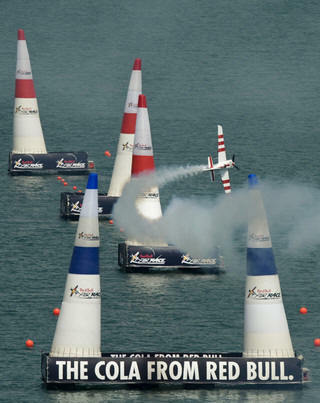 July 18, 2009, moving the Red Bull Air Race around the world is no easy task. Although the entire infrastructure – from the airplanes and hangars to the pylons and race tower – can be built up and then disassembled like clockwork over a three-week period, there are countless behind-the-scenes challenges involved in orchestrating the transport of 15 pilots, their planes and their teams, as well as a 400-member race crew and the 400 tonnes of material that keep the logistics team constantly on their toes. Whether those challenges include contingency plans to cope with pirates in the Indian Ocean or ensuring that all the international customs requirements in the world’s major ports and airports are fulfilled, the highly motivated logistics team is on a tireless mission to move the entire race from country to country and from continent to continent as safely, as efficiently, as inexpensively and as environmentally friendly as possible. It’s a Herculean task by any measure and one that is made even more astonishing if you consider that there are no existing arenas, no stadiums, no venues nor grandstands for the races – in other words: the entire racing and spectator infrastructure is packed up and moved from location to location, and the grounds that are used have to be restored to their pre-race serenity within days. The team has the ambitious goal of even improving the area where races are held; in fact, Monument Valley now has a small tarmac runway instead of the short bumpy dirty runway it had before, thanks to the Red Bull Air Race. “It’s extremely exciting but at the same time extremely challenging to find the best and most creative way to coordinate all these massive and complex transport flows,” said Christof Reichl, Logistics Manager for the Red Bull Air Race World Championship. Sea freight is used to transport as much of the equipment as possible for both cost and environmental reasons, although relying on air freight for inter-continental movements is sometimes unavoidable for the disassembled race planes or the electronic and television broadcasting equipment. But aside from the planes and other one-of-a-kind pieces of equipment that have to be delivered to every race location, there are two complete sets of most of the infrastructure materials. That makes it possible to ship by sea freight from location to location in their respective parts of the world in time. Rail freight, rather than trucking, was also used for the first time this year in transporting the 400 tonnes of infrastructure from San Diego, the second race of the season, to Windsor, Ontario in Canada for the third race of the year five weeks later on June 13/14. The 15 teams ferried their own racing planes cross-country by air from San Diego to Windsor – the same method of transport for the planes between races in Europe. Otherwise, the planes are disassembled into about 3 major pieces for overseas transports (fuselage, wing box, tail box). The wings are removed and placed in eight-metre long boxes that resemble giant guitar cases. The rudders and horizontal stabilizers from the tail structure are put in separate padded cases. Most of the electronics and components such as the instrument panel and fuel tank are removed in conjunction with removing the wing. The stripped down six-metre long fuselage is strapped to a pallet. It takes about six hours to take the planes apart and about 18 hours to put them back together again. There are two main areas where the infrastructure is set up for each race: the so-called “Red Bull Air Race Airport” at a nearby airfield where the hangars are put up and the pilots are based with their teams; and the racing venue itself, where the tower, communications centre, media centre, High Flyer’s Lounge and Race Club hospitality lounges, and water operations including portable barges and Air Gate pylons are set up – as well as the scores of stands and giant video screens for the public viewing areas. The work on site begins 14 days before race day when the first 150 crew members arrive, and working with additional assistance hired locally, they reassemble the two-storey mobile communications centre, complete with high-speed internet connectivity and power. That’s where about 50 people coordinating the broadcast and communications will be working on race day and it takes two to three days to put together. After that the 25-metre-high and 35-tonne race control tower, where about 25 officials will be working on race day, is put up. “Once it’s built, the tower is as sturdy as a four-storey house,” Brauneis said. The hangars at the airport and the scores of other buildings are assembled in a series of fluid steps after that. The majority of structures are already erected before the bulk of the crew begins to arrive about four to six days before the race. What is astonishing is how quickly and smoothly it is all put together by the indefatigable teams. The work has multiplied as the race has grown from about 100 staff five years ago to around 400 now.